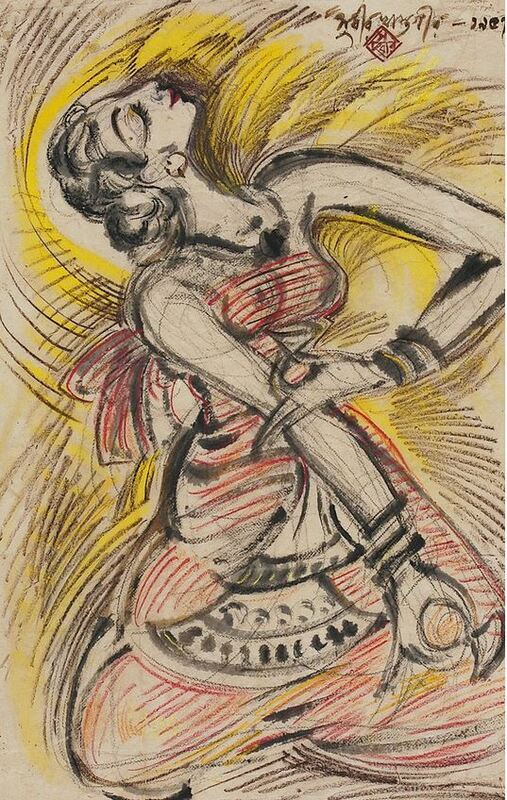 Sudhir Khastgir, Dancing Figure, 1962. The lower panels indicate the earrings and forehead ornament, a little bit of the knotted ponytail, bangles and the girdle. Another painting by Khastagir (1957). Unfortunately I have lost the source and my notes on this. This entry was posted in 1950s, 1960s, Art, Bengal, Costume, Dance, Dancer, indian art, Indian Dress, Indian men, Indian Women, mid century, Paintings, Vintage, vintage art, vintage costume, Vintage Dress, women in art and tagged 1950s, 1960s, art of bengal, Dancers, Indian Art, sudhir khastgir. Bookmark the permalink.